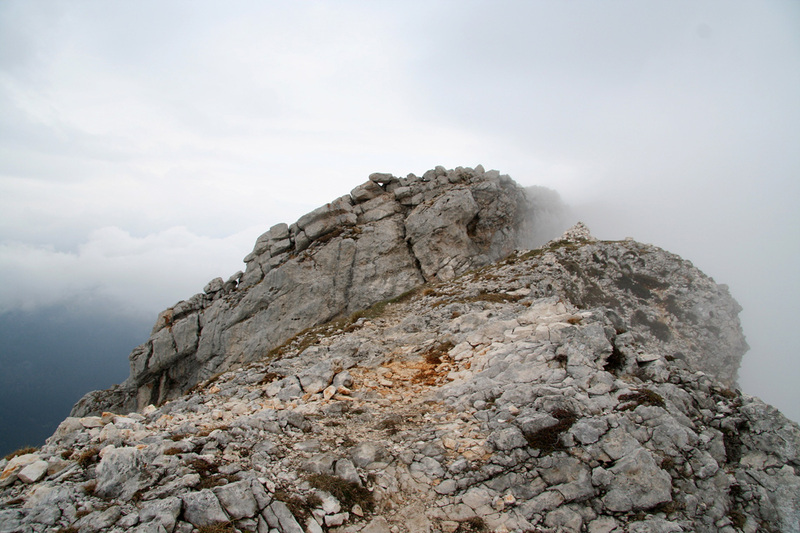 How to get there: This mountains in north of the French city Grenoble. 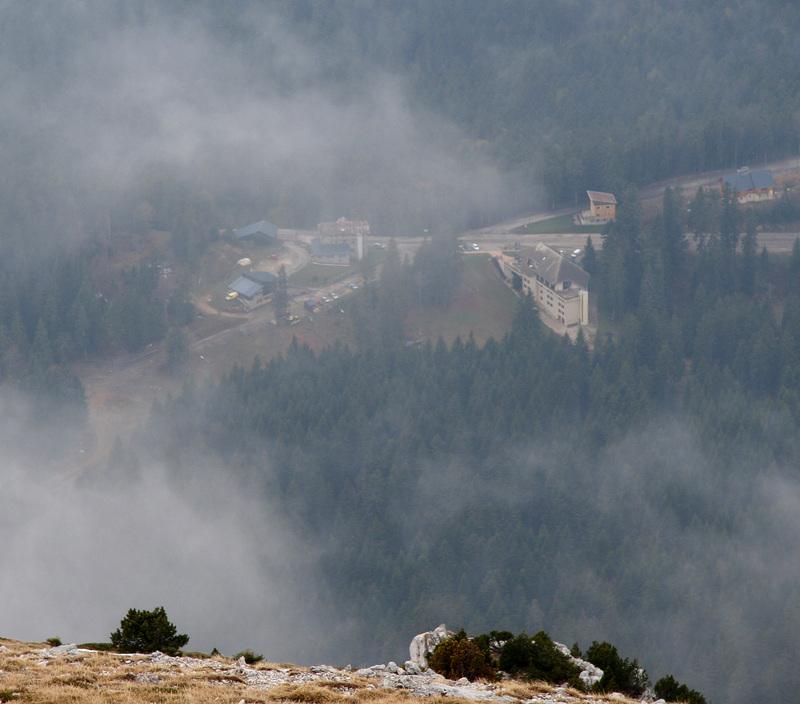 From Grenoble, locate the local road D512 and drive about 16 kilometer north until the pass called Col de Porte (1326 m). There is parking on the right hand side, next to a cafe or a bit nearer the ski area. This is the trailhead, location N45:17.397, E005:46.026. The nearest major airport is Lyon. From Lyon, head towards Grenoble on A43 connecting to A48. In or near Grenoble, exit to Hwy. N75 connecting to the local road D512. Alternatively, one can drive to Col de Porte from the north. Do not connect from A43 to A48, rather stay on A48 and take Exit 9 to La Tour du Pin. Drive there on Hwy. N6 and connect to road D520 near Les Echelles, then D520B left in the village of Saint-Laurent-du-Pont. This road takes you up an interesting canyon and connects to road D512 in the small village La Diat. Either way, allocate about 2 hours for the transfer from Lyon to Col de Porte. Route description: From the Col de Porte, proceed straight towards the downhill ski slope. After a few hundred meter only, you pass a low building with an almost flat roof on your right hand side. Shortly after this, you should see a broad trail (old forest road) that forks left in among the big trees. Take this path, it gains elevation and eventually turns right making it almost back to the ski slope before it ends at elevation 1554 meter, N45:17.205, E005:46.665. Just before the end, a distinct trail forks (sharply) left and heads further uphill. This trail also turns back towards the top of the ski slope near a small private shelter at elevation 1634m, N45:17.152, E005:46.778. Before reaching this shelter, the trail climbs left into the more grassy hillside and zig-zags uphill towards a very characteristic rock formation. This mushroom shaped rock immeditaely catches your attention. It has a name plaque, La Folatiere, at elevation 1743 meter. 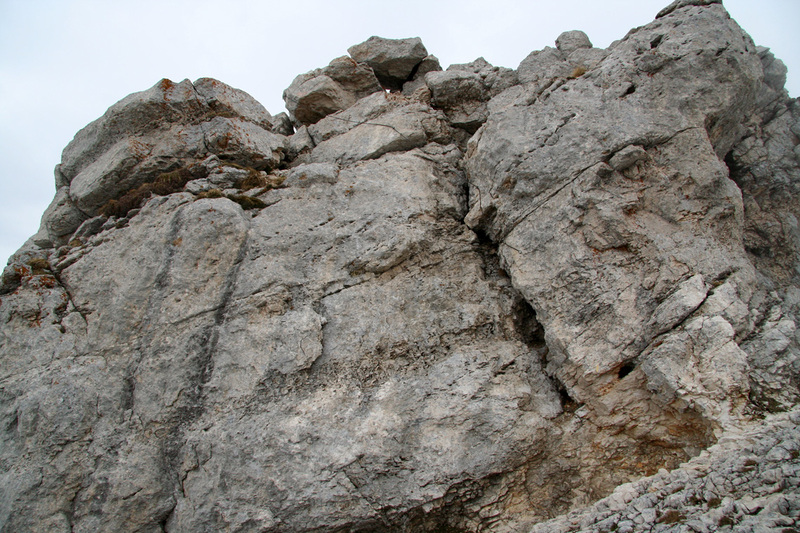 From this rock, there are two different routes to the summit. The easiest and most direct route follows the smaller trail up on the left side of La Folatiere, while an alternative trail traverses right (south) of this rock. Both trails are described, it is recommended to try both, by descending on the alternative trail. In early May, the direct route had significantly less snow than the alternative, south loop trail. 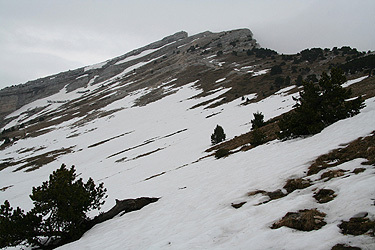 A, Direct route: Hike on the left (north) side of La Folatiere, and continue uphill. Above you, there is an obvious gully with big rock formations on either side. The trail zig-zags up towards its entrance. It may appear to be a dead end, however as it turns out, provides an excellent passage to the terrain above the cliffs. Just below the entrance is the steepest slope of this route and in early spring there may be a patch of snow here. (An ice axe may be useful if this snow is icy). Once into the gully, the terrain is easy as the gully bends left and exits on the upper slope of the mountain (1932m, N45:17.296, E005:47.123). 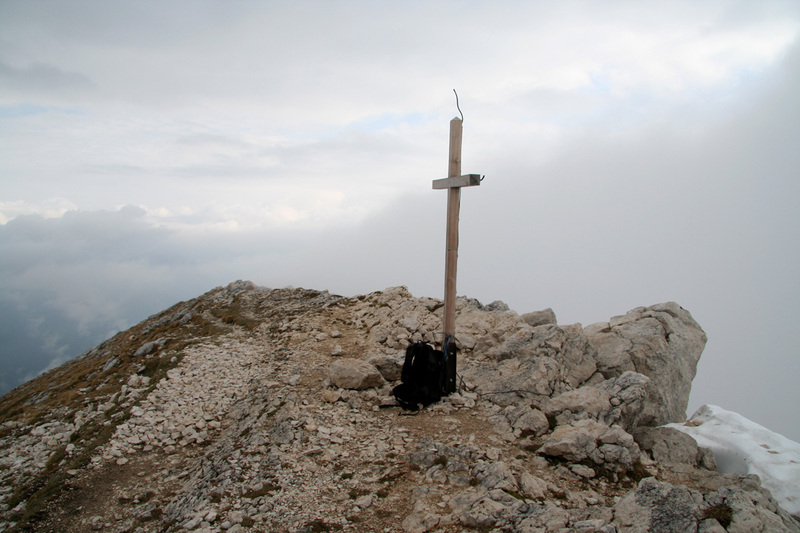 From here, the trail zig-zags on an easy slope directly to the summit cross that can be seen above. I have assigned a (YDS) class 2 to this route because of the short segment just below the gully that was covered by snow when I climbed the mountain. In summer, the difficulty may indeed be closer to a (YDS) class 1 trail. B, South loop: From the mushroom rock named La Folatiere, traverse right (south) on a pretty big trail. This trail climbs among big trees before getting out on a large, gentle slope. In early spring, this entire section may be covered by snow. Continue a gentle climb across the slope until the trail curves left and reaches the crest of the ridge. This is the south ridge of Chamechaude. The opposite (east) face is much steeper and requires climbing. Just as the trail hits the ridge proper, a cable assisted route (Via Ferrata) comes up in a narrow gully on the steep side. This route is called Breche Paul-Arnoud. The trail now continues up along the crest of the mountain. 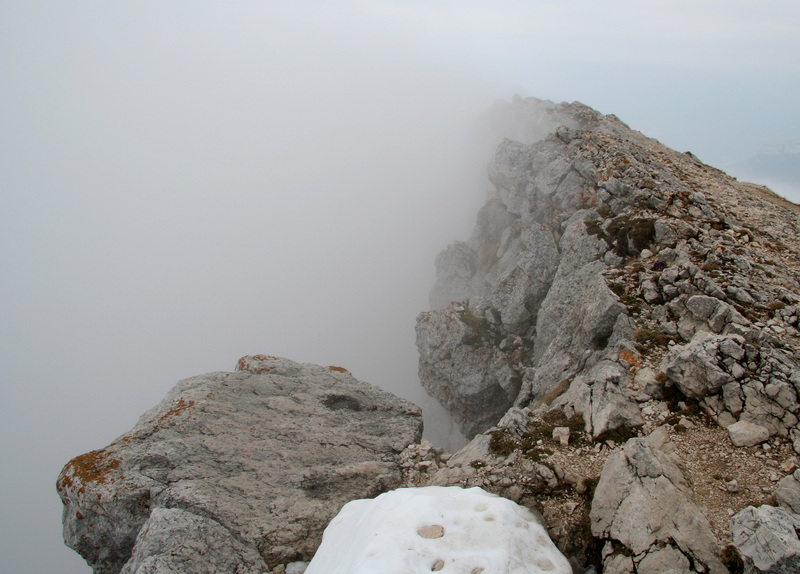 There are no difficulties except for a single short step in order to climb a cliff band that otherwise blocks access to the summit ridge. This step is climbed along a distinct crack and there is a cable on the upper part of the step. This is a short (YDS) class 3 section. From the top of this step, the summit is just an easy stroll along the top ridge. This trail is (YDS) class 1 the entire way except for the short climb described above. Comments: I was headed for a meeting in Barcelona starting on a Monday and planned to use the weekend to see if climbs of Chamechaude and Puy de Sancy were possible in early May. I drove from Lyon early Saturday morning and started hiking from Col de Porte at 0830, making the summit after 1.5 hours at 1000. There was not a single footprint in the snow below the key upper gully and I had the mountain for myself. 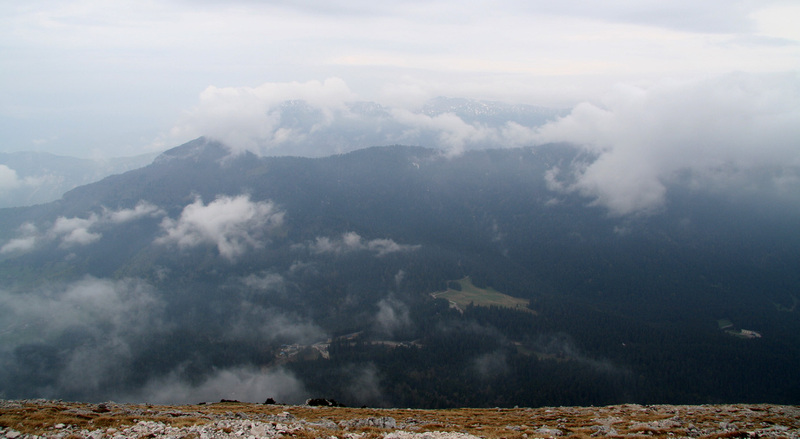 Unfortunately, drifting clouds and fog prevented a really nice view. I could see back down to Col de Porte, but nothing down on the steeper side. I made a 15 minute rest, then continued to explore the south ridge route on my descent. This route had considerably more snow and the trail vanished as soon as I left the ridge. Voices alerted me to look down Breche Paul-Arnoud and welcome two climbers completing their route, I assured them that the remaining section was short and easy. Further down, near the small shelter, I met a larger group heading uphill. They had just crossed the snow near the private shelter and worried about the conditions higher up. I therefore recommended them to take the direct route where my solid footsteps should provide safe passage across the single patch of moderately steep snow that remained on the route. I reached the car at 1100, a descent of about 45 minutes. Ample time to drive towards the base of my next goal, Puy de Sancy. 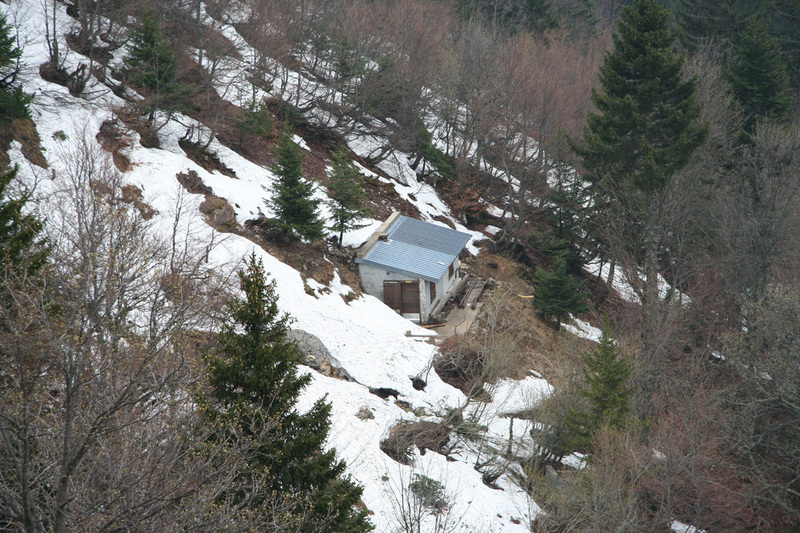 The small shelter, seen while ascending. The ascent route had two patches of snow, here and just below the upper gully. 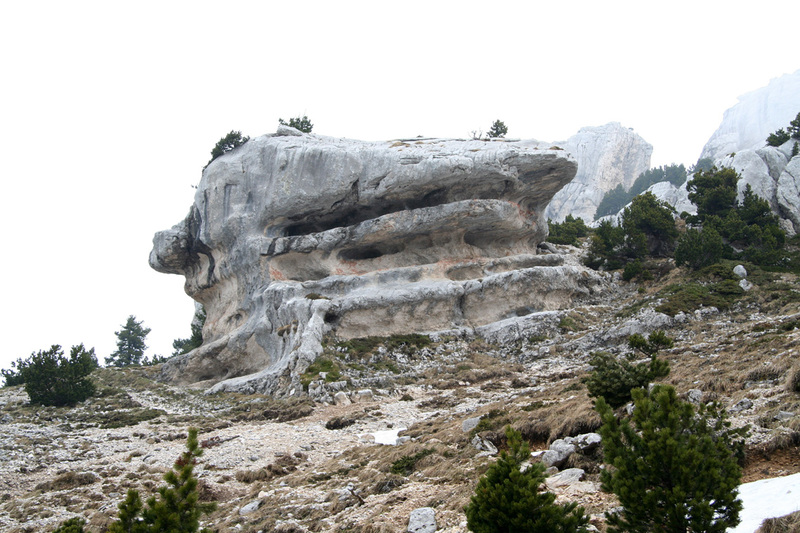 La Folatiere, a mushroom shaped rock at elevation 1743m, where the trail forks. View west, Col de Porte in the foreground below. The crux, on the south loop route. This is the only place where the difficulty exceeds (YDS) class 1. Note the cable higher up. The south ridge, the route curves back down on the snow field. Looking back, the south ridge with the rock step. Chamechaude west flank and south ridge. From here, the south loop route follows the ridge to the summit.